Yesterday on my blog, was a very special guest post by Elaine from This Grateful Mama. Today, I have Elaine’s wonderful addition to “The Wonder of It All”; and it is a breath-taking and overwhelming account of the Lord’s love for us. The combination of her words and vivid imagery paint a picture you do not want to miss reading centered on the birth of our Savior, Jesus Christ. Do you ever find yourself wrapped up in the bustling holiday schedule, and even though you keep Christ as the center of the events, you find yourself missing the feeling of WONDER? You know, the magic, the feeling of joy and mystery, and gratitude that seems to come so easily to children. And lets be clear: I am not talking about the wonder of Santa, although I do not think Santa is a bad thing. But lets set the Santa discussion aside for another day. I spent last Christmas, focused on Jesus, and while I certainly felt grateful that He came to save the world (to save me), I am sad to say, I didn’t feel AWE. Because we are busy. Because I’m often guilty of being so analytical in my thinking that I lose my imagination; I read the facts and commit them to memory, but I have trouble thinking on a deeper level. And, the story is familiar. Of course, I want scripture to be familiar…but it is never a good thing to think it doesn’t hold truths we don’t already know, just because we have read it before. It is meant to be treasured, each time, and then to be questioned, wondered at, and pondered. So I’ve been reading the gospel accounts of Jesus’ birth, over and over, and have been trying to spend time really thinking about what is said, and what IS NOT SAID. In the process, I have generated more questions than answers, and the questions have left me with a sense of wonder…that this story has truths that are not revealed, that I cannot understand within the limits of my human mind, and that cannot be explained by science, reasoning, or deduction. Like much in the Bible, there are details and truths in this story that God intentionally left out; mysteries left behind for us to marvel at. So while I don’t know all the answers, I do know is that the Christmas story – the miracles, the gift of God’s son, and the great work of God that began with Jesus’ birth deserves not only to be read, but to be studied, reflected on, and to be AWED at…with wide eyes. In order to experience the WONDER of Christmas, I have to take time to realize what there is to wonder about. As I posted last week, I have spent a lot of time thinking about Mary, and what her experience would have been like if it happened to, gulp, ME. 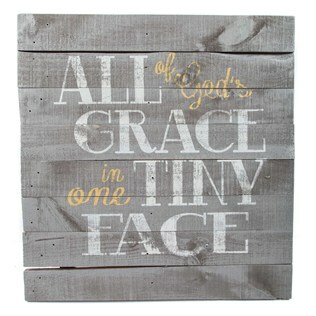 I’d seen the sign before and had thought about how cute it would be in a new baby’s room. But never before had I made a connection to Jesus and how these words are more than fitting to describe His birth. It is easy to think of Jesus as a cuddly baby and to celebrate His birthday. I’m sure He was cuddly. I’m sure he was as sweet as newborn babies are. Complete with ten tiny toes, ten tiny fingers, and baby soft skin and hair. I’m sure Mary and Joseph thought there was never a baby as cute as Him. There was certainly never a baby as miraculous as Him, but we know Jesus was ordinary. By looks, I’m sure he blended in with the crowd – it was His actions and character that set Him apart. The meaning of Christmas is more than just the miracle of His conception by the Holy Spirit and birth to a virgin. God did not have to send Jesus. And Jesus did not have to abide by the Father’s will. God does not have to love us. And furthermore, God could have kept his plan limited to His chosen people, Israel. He didn’t have to blow the doors off their hinges and open the way for the rest of us to come to know Him and be saved. The truth is, He doesn’t have to do anything. Which means…He chooses to love, to redeem, to save. Perfectly. I have no reason to offer God that can make Him want to include me, to save me, to love me. In reality, I should be unlovable by God – sinful, ungrateful, selfish…I could go on…In God’s holy presence, I deserve judgement and wrath. He is far too holy to tolerate even ONE of my many, many sins. I deserve Hell; we all do. And yet, on that day, God became flesh – Emmanuel. God With Us. Why God would desire to be WITH us…I cannot answer. But when He came to earth as a baby, He not only dwelled here, but He paved the way for the Holy Spirit to dwell WITHIN us. In us. A gift we don’t deserve. No words can express how priceless this gift is. Jesus was fully God. Can you fathom what this means? Was He actively restraining His power at all times while on earth? Did He, as a tiny baby, have to allow Mary to take care of Him? He certainly had the power to meet His own needs. And yet, allowing others to raise Him, care for Him…Was that a part of how He humbled Himself to experience our life? Did He do it to show how only He could remain sinless as He experienced our physical and daily challenges and temptations? I don’t think we’ll know these things on earth, but I can’t wait to ask Him in heaven. Our God is certainly powerful, but He also has the utmost self-control – The RESTRAINT required to live 30 years without showing His power…Oh my. It’s unfathomable. He makes no mistakes. He committed no sins. He MEANT to come, to carry out this amazing plan, to fulfill every single prophecy, to serve us and love us in this way. He was all-powerful, all-knowing, and able to do anything. But He lived a quiet life before His ministry began. His life’s sole focus was on fulfilling an eternal purpose. To save us. Us. He chose no worldly glory – He didn’t come to reign as King and to rule over all, even though He is the ultimate King, of ALL Kings. Ruling here could have been His rightful place. But His plan was eternal. More perfect than we can understand; and a plan we could NEVER come up with. He aimed to save as many as possible. A plan to end ALL plans. Certainly we cannot know the truth of all of these mysteries…but I believe HE KNEW all of this the whole time He was on earth. It doesn’t explicitly say in the Bible if as an infant Jesus was pondering these things, but since He was fully God, I believe He did. I believe that when Jesus came as a baby, He knew how and when His life would end. Can you imagine the self control, love, and faithfulness of living each day for 33 years, knowing the exact time and circumstances of your death? He knew He would be ridiculed, punished, beaten, spit on, and hated by those He loved and came to save. The sins of those who brutally crucified Him, He bore on the cross. He looked in their eyes, knew their names, and heard andfelt their scorn. Do you wonder how love could be so big? So deep? So motivating to God that He would do all this? Do you wonder how an all-powerful God could be so humble as to enter His own creation? To feel pain, physical exhaustion, and all of our frailty? And to be unrecognized, and to be rejected, all while not striking down those who certainly deserved it? Jesus entered a world of sin. Full of sin. As THE Holy God. Every person who had ever lived before, and has lived since deserves His WRATH. Yet He held it back, even when surrounded by sinful men, women, and children. And oh, do we need His grace…But we don’t deserve it, and can’t earn it. It gives a new perspective on Christmas. It brings depth, peace, joy and gratitude at a new level. Here I stand today, washed white as snow by the blood of Jesus, all because Jesus came as a baby…grew up…and died for me. I find myself finishing this post, words blurred by tears of joy (If you know me, you know that tears do not flow freely for me very often – it holds significance here). They are welcome tears to someone who often sees the facts but often misses the heart of scripture. I find my thoughts wrapped up in the mystery…in awe…in gratitude…at the wonder of it all.